If you are an AT&T subscriber, you might have noticed already that your carrier doesn't offer Galaxy S9 incentives outright, though its prices on Samsung's newest flagships are a hair lower than what you would shell out on Verizon, for instance, and still way higher than T-Mobile's $360 Galaxy S7 trade-in offer for a $720 Galaxy S9. What do? Well, you can always go to Best Buy, and get your S9 or S9+ there, as the retailer gives $100 if you preorder today, plus Samsung's blanket "up to $350" rebate for an eligible trade-in. 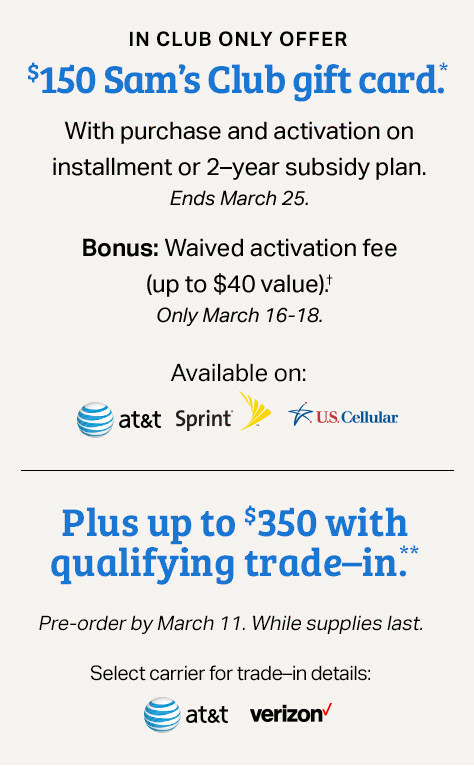 The good part is that you can haggle with the rep to apply the discounts as a down payment on your phone immediately, and pay the rest on installments over 24 or 30 months on AT&T, which would essentially mean something like $13 a month if you choose to pay over a 30-month period, and trade-in, say, your oldie Galaxy S7 for an S9. This may sound like the best deal on Samsung's latest and greatest so far, but wait, there is an even better one. Sam's Club, the wholesaler, will give you a $150 gift card if you buy the Galaxy S9 or S9+ on AT&T (but also Sprint or U.S. Cellular). The reason that the offer is so good, is that it stacks up on top of the "up to $350 trade-in for eligible phones," too, beating Best Buy's today-only deal with fifty bucks. Moreover, you get your $40 activation fee waived if you go the Sam's Club route between March 16-18, when the phones launch. The fine print? Well, you have to purchase the Galaxy S9 and S9+ on installments, and the $150 gift card can't be used as a down payment on the phones, or to pay your Sam's Club membership fee. The offer is also not available for Business Accounts, as usual, and it can't be had online, you'd actually have to go to a store to activate it. Galaxy S7, S7 edge, S7 Active with cracked screen - up to $100. iPhone 6s, 6s Plus, 6, 6 Plus - $150 off. LG G6 - $150 off. Pixel, Pixel XL - $150 off. It makes sense depending on which phone you trade in. I got The S9+ for $530 tax included after trading in the S7 Edge and getting the student discount from Samsung site.